This seems to have made the rounds a couple of months back, but I hadn’t seen it till now. 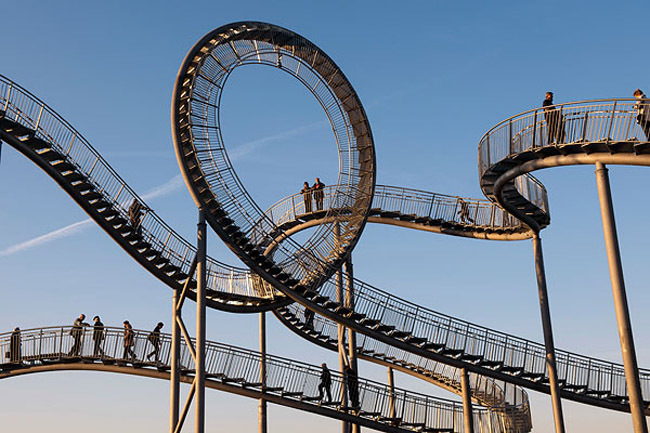 Tiger and Turtle – Magic Mountain is a site-specific, large-scale, walkable rollercoaster designed by Heike Mutter and Ulrich Genth positioned at the highest peak of the Heinrich-Hildebrand-Höhe in Duisburg, Germany. 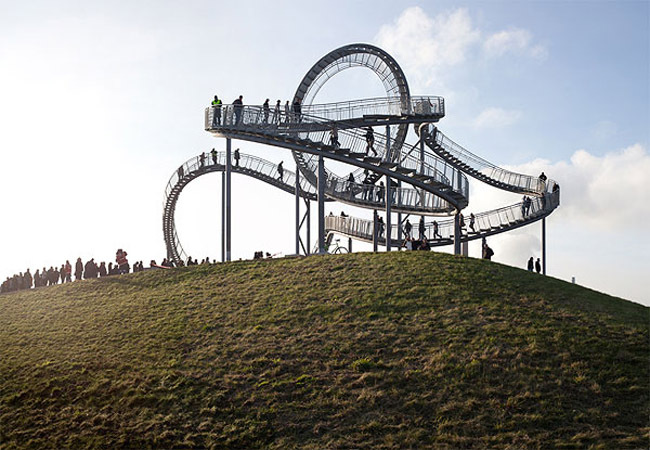 Visitors are invited to walk up the zinc-plated steel sculpture, which soars to 21 meters at its highest point, and, add to that the height of the artificial mountain that it sits upon, and a person gets a view of the Rhine from 45 meters above the landscape. Unfortunately, for the more adventurous types, you can’t actually climb on the center loop past a certain point. Mutter and Genthe collaborated with Arnold Walz who did the parametric 3-D planning and stairway system, as well as Prof. Micahel Staffa who did the planning of structural framework, and architects Sonja Becker and Rudiger Karzel of bk2a architecture. The interactive sculpture is lit up by LEDs under the handrails at night, making it accessible in the dark as well. My kind of rollercoaster. This entry was posted in Architecture, Art, Fun, Interaction Design, Just Plain Cool, Stuff We Like. Bookmark the permalink.